Mr. York has continued to stay true to his vision and continually focuses on providing the quality of service every customer deserves. 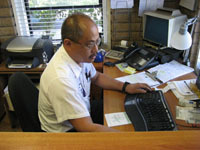 Mr. York emphasizes that customer service is his #1 priority and that the business grows when his customers are happy. We would like to take this opportunity to express our gratitude for your continued support and trust in our service and staff. Thank you, we look forward to serving you in the future!